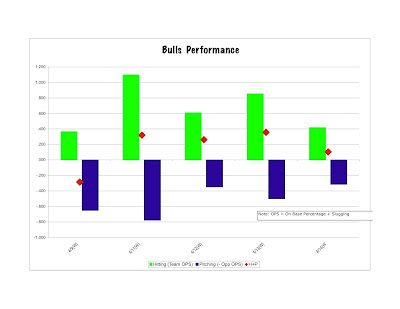 Those who have sat near me for the last couple of years have made the mistake of encouraging me in drawing up charts of how the Bulls are doing. Since we’ve now gone through the pitching rotation one time, I thought I’d produce a set. Click on a chart to get a larger view. This first chart is an admittedly idiosyncratic way of looking at the Bulls, but they get at something I think is important. That is, how the team is doing as opposed to individuals. We know that the ultimate measure is, of course, wins and losses. But over time trends can sometimes be seen. What I’ve plotted here is simply the team OPS for a game again the opponents OPS (as a negative number) and called it hitting (green) and pitching (blue). Usually, if you add the two up and the difference is greater than 0, we won. Where there’s an anomaly, as there was in the first game), a close look at the scorecard will explain it. In this case, a couple of double plays got us out of trouble. The second chart looks at the pitchers (and the team as a whole) more closely. 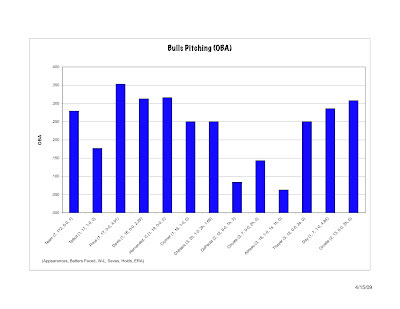 Here I’ve charted each pitcher's OBA, or on base average. That’s simply how many guys got on base with a hit, a walk, or being hit by the pitcher. OPS might be a better number, but very difficult to pull out of the box scores for a game. I’m not a big fan of ERA as a measure of a pitcher’s performance, but I’ve got it down there beside their names along with a few other more conventional measures. A hold, by the way, is a relatively new stat introduced, most likely, by relievers’ agents, to show how middle relievers did in a game. An interesting thing about this one is that David Price has the worst numbers. But this is a very small sample. Have to think that over time this will change.